Is this madness? 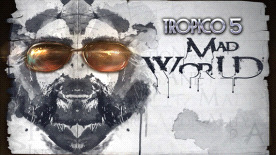 No, this is Tropico! Find new ways of disposing unwanted opposition to your regime by installing the asylum, including straight jackets, isolation cells, electroconvulsive therapy and more! It’s time to enter the rabbit hole and see how deep it really goes. Are you still reading this? Feeling a little dizzy? Don’t be afraid, we have already reserved a special place in the asylum for you. . . .